The part is built in kivd and TetR repressible promoter that constitutively ON and repressed by tetR. And in the end, terminatorPart:BBa_B0015 is included. 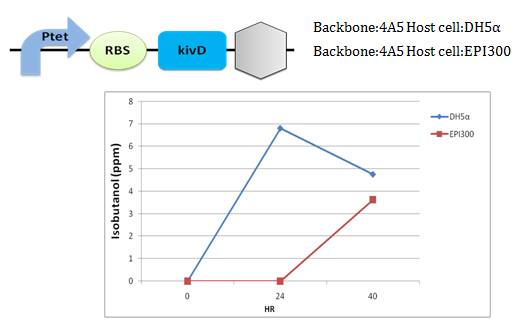 The coding sequence of kivd is from Lactococcus lactis subsp. It encodes alpha-ketoisovalerate decarboxylase which is responsible for the decarboxylation into aldehydes of α-keto acids derived from amino acid transamination. This is part of the isobutanol biosynthesis pathway. We want to make the isobutanol biosynthetic pathway under low-temperature induced system that has been constructed by 2010 NCTU Formosa. Combining this circuit with BBa_K539691 which is included gene of alss, ilvC, ilvD achieve the high production in isobutanol. In traditional genetic engineering method(Figure 1), we use strong promoter to initiate our genes, but this way E.coli will overexpress the proteins we need in synthetic pathway. However, this overexpression of target proteins will cause E.coli wastes its limited growth resources, or the activity and performance of the enzymes may be too low. In this situation, it unbalances the synthetic pathway, and the production of isobutanol will not be optimum. This is also a problem in the production of isobutanol which is poisonous to E.coli. To solve the problem, we need to adjust the expression of the genes, and make sure every intermediate can be catalyzed by the very next enzyme. The intermediates of isobutanol can be catalyzed step by step till they become the target products we want. In the new method we design, we control the pathway by stopping the mechanism when it reaches the step to produce non-toxic intermediate (2-Ketoisovalerate ) which we want to accumulate, then under specific thermal control, the mechanism would continue to express. The advantage of our new method is that the precursors are much less toxic for E.coli than our target product (isobutanol) is. We then apply this new method to our project. We first accumulate lots of the non-toxic intermediate as the precursor, 2-Ketoisovalerate, to a certain amount, and then convert the entire non-toxic precursor into the product, isobutanol, all at once. In order to achieve the goal of our experimental design, we apply carbohydrate fermentation to gain our product. First, we choose glucose as the resource to get through biosynthetic pathway, and we can harvest isobutanol which is the derivative of butanol. 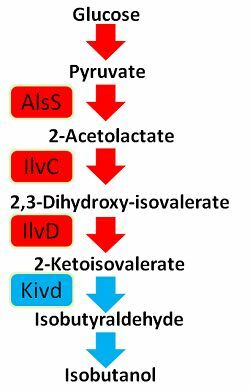 Glucose can be catalyzed into isobutanol through afterward enzymes- Alss, Ilvc, Ilvd,and Kivd step by step. We can also stop any step to accumulate the intermediates we want (see picture Overall Reaction). Figure 3. When the temperature reaches 37℃, tetR will be expressed and TetR will inhibit ptet. In this way, Part:BBa_K539742 will not be expressed. We transform the circuit BBa_K539742 ,which is inserted in pSB4A5, into DH5α and EPI300 and collect the bacteria incubated for 0HR, 24HR and 40 HR to find out the most appropriate host cell. After the analysis of GC we find out that DH5α is much better than EPI300 for this circuit, because it can provide higher productive rate of isobutanol. Therefore, we chose DH5α as the host in the following experiments. Figure 4. This diagram indicates that DH5α is very suitable for this circuit K539742 , because it can provide higher productive rate of isobutanol. We construct two devices. The first one is normal butanol synthetic device that includes alss, ilvC, ilvD and kivd only. (BBa_K539671 and BBa_K539742 ) The second one includes alss, ilvC, ilvD and kivd with low-temperature released device. ( BBa_K539691 and BBa_K539742 )As the result, in both devices, they tend to produce isobutanol increasingly in lower incubation temperature. However, the tendency is much more significant in low-temperature released device. 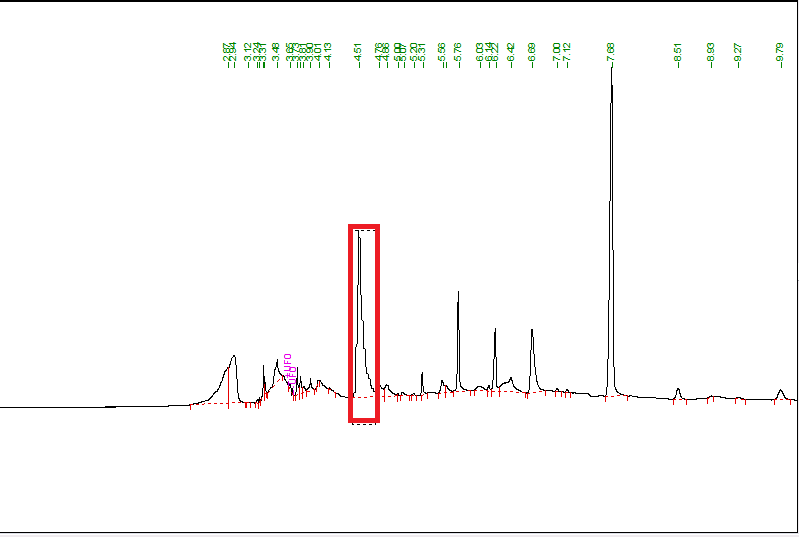 We successfully improve the production of isobutanol by low-temperature released device. Figure 6, 7 and 8 represent the GC analysis of our bacterial culture. The peaks represent different kinds of alcohol respectively. The time axis is above the peaks. 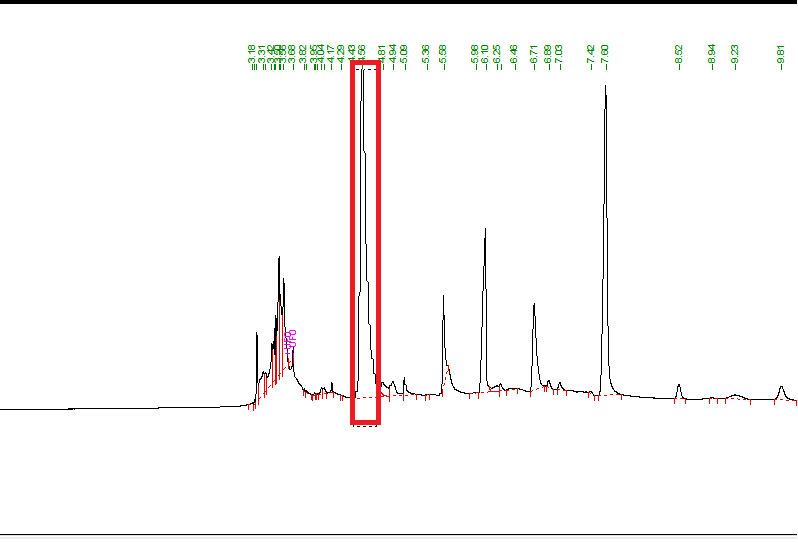 The peak of isobutanol appears at 4.55 to 4.62 minute. First ,we incubate the bacteria at 37℃ and until O.D. reaches 0.5, then culture it at 30℃, 37℃ and 42℃ for 24hr respectively. We measure the medium composition by GC. The results are shown in Figure 3, 4 and 5, and we calculate the area of the peak of isobutanol. As the result, we find out that the related concentration of isobutanol decreases when the temperature rises. Combine all the experiments did, our butanol pathway works perfectly with our low-temperature device. Figure 6. Cotransform two circuits, BBa_K539691 and BBa_K539742 , into DH5α. 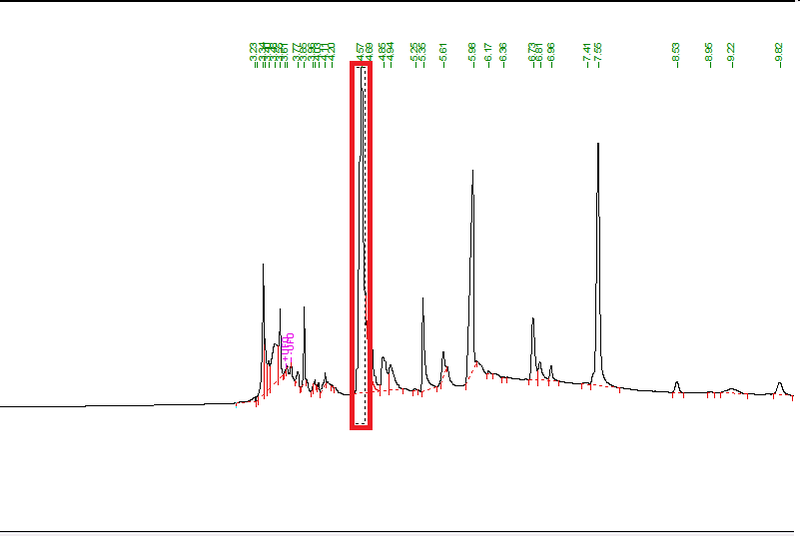 Incubate DH5αat 37℃ until OD reaches 0.5, then transfer it into 30℃ and incubate for 24hr and we analyze the chemical composition of medium by GC. Figure 7. Cotransform two circuits, BBa_K539691 and BBa_K539742, into DH5α. Incubate DH5αat 37℃ until OD reaches 0.5, then transfer it into 37℃ and incubate for 24hr and we analyze the chemical composition of medium by GC. Figure 8. Cotransform two circuits, BBa_K539691 and BBa_K539742 , into DH5α. Incubate DH5α at 37℃ until OD reaches 0.5, then transfer it into 42℃ and incubate for 24hr and we analyze the chemical composition of medium by GC. 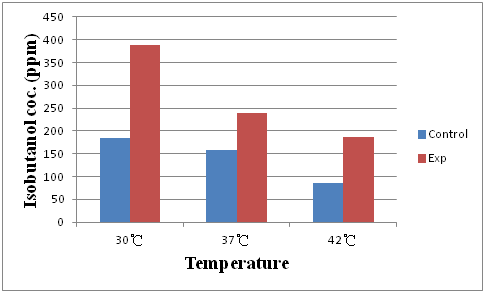 We control the temperature when cultivate E.coli, as what we expected that the production of isobutanol will increase in lower incubation temperature. Concluding above, we make the gene expression under low-temperature released decice. High temperature contributes to low production of cytotoxic isobutanol but high accumulation of the non-toxic intermediate, 2-ketoisovalerate. When we control the temperature to lower degree, the production of isobutanol will increase. In this way, we successfully gain our target product with the most efficient method.